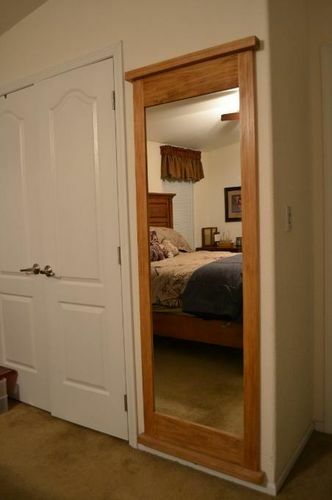 I was asked to build a free standing dressing mirror for the bedroom. But since space is always tight I decided to put it on the wall. My concern was how to hang it. I looked around LJ and saw a few had used a french cleat which I had pretty much decided on going with, but I wanted it to sit very close to the wall so ruled it out. At the same time I was building some drawers and thats when I thought of using drawer slides and the project evolved from there. I dadoed a slot for the slides on the back of the mirror which allowed for the mirror to sit about 3/16”” off the wall. Its almost impossible to see the slides and you’d never guess that there was anything behind it or that it moves. I used a set of self closing slides so that the mirror does not move unless you give it a gentle tug. It slides very easy and overall I’m very happy with the way it turned out. Because the box is only as deep as a stud my ties would get swiped as the mirror opened and closed, so I added a little pivoting arm to keep them from rubbing. Both my sons have asked that I build one in their own homes to conceal their gun safes… which means another fun project for the future! I’m going to be dead honest with you. When I first looked at your post title it seemed very boring but I deceided to give a look nonetheless….I’m glad I did! Your wall modification in conjuction with the mirrior is a wicked cool idea!!! that is so cool.i’ll put that on my list of things to do. Excellent idea!! 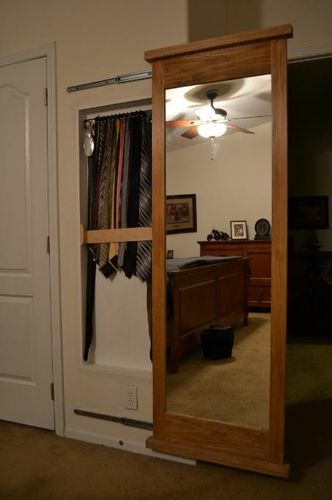 Great place to safely conceal fire arms, and or other valuables. Unique, but I see you only have two sliders. If they are 100 pounders then I’m sure You are safe. This is original and I like it. What a great idea. This is stinking awesome! Love it! Looks great and well installed. Great idea on the sliding mechanism and the hidden storage. Great job!